Last Saturday was one of those busy errand days where you do nothing but run from store to store, denture then come home and clean the house and go for a run. You know – they kind of day that makes you really hungry, but by the end of it, there’s no way you want to cook. Good thing I started this braise hours before dinner, before I’d cleaned the house and expended all my energy. Good thing it was a mostly one-pot meal and I’d already washed and put away all the prep dishes before collapsing. And dinner? Not to get overly Martha, but it was a very Good Thing. I used pomegranate juice, fresh orange juice and red wine as my braising liquids and dried guijillo peppers and tart cherries for flavor. The juice and wine reduced into a deliciously concentrated sauce, the peppers lent some good spice to contrast the plump cherries and the meat was so very tender that I had a hard time moving it to the serving dish without it falling apart. This dish is everything I wanted at the end of that long day. And leftovers were just as good or even better. My favorite kind of meal. Set a large oven-safe pot over medium heat. Heat the olive oil, then sear the pork for about 5 minutes on each side until a golden brown char forms. Add the remaining ingredients to the pot, cover and place in the oven. Turn the oven on to 325° and cook for 3 hours, turning occasionally. Good thing I stocked up on dried Michigan cherries during my recent visit to Traverse City. This looks awesome. Sounds great! 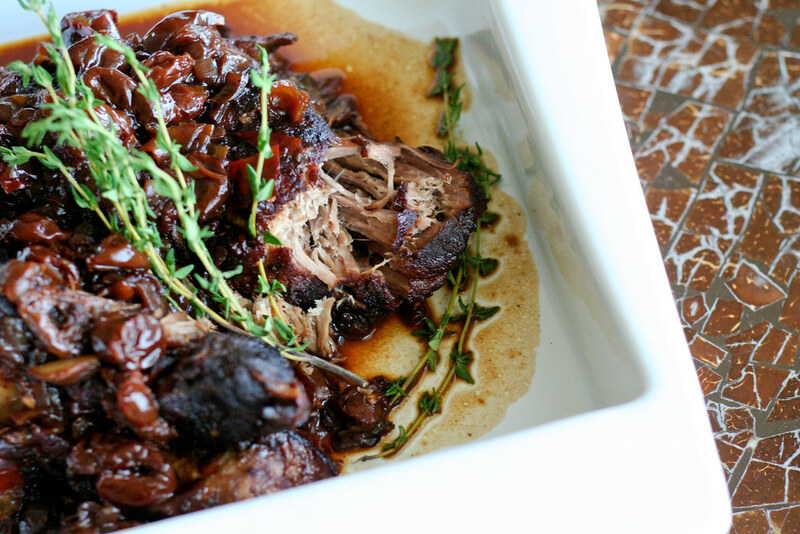 I made an incredible braised beef short ribs recipe, and pork chops with a delish apple-dried cherry sauce. I love fall! This is my first visit to your site. Great sounding recipes and pics! I made this last night and it was so yummy. Thank you for the great recipe. Excellent recipe. I don’t know what quajillos are, so I used some dried sorrentos I had on hand — about a half dozen. After searing the meat, I threw it in a crock pot, set on high, for three hours. Never turned the meat. When I was done, I drained the liquid and reduced it to a sauce in a frying pan. Added some cloves along the way. Thanks. Nothing better than braised pork the day after. Definitely a Sunday type of dish where it cooks while you clean/do errands! When you carve the roast pork arrange on platter and spoon pan juice over top.